The Manila International Book Fair has come and gone. 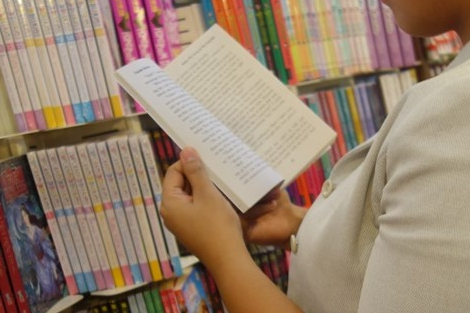 And we’re sure you were one of hundreds of book geeks and lovers who trekked along with us to the SMX Convention Center in Pasay City for the annual book event. If you’re like me and have a tendency to become overwhelmed by mountains and mountains of glorious, glossy paperbacks, then you probably need a little guidance for your next foray into the book wonderland that is the book sale/fair. 1. Arm yourself with these shopping essentials—a tote (or two or three), comfy shoes and a map. Book shopping is backbreaking work. Unless you have mastered telekinesis or can “Wingardium Leviosa” the heck out of those books, it’s a good idea to bring a shopping bag with you, especially if you’re buying a library-full of books. Also, wear your comfiest footwear so you can navigate the aisles better. A map of the venue won’t hurt either, particularly if there are a number booksellers participating in the sale. Knowing which books you plan on buying is plain smart shopping. Not only will you save on time and effort, you definitely won’t miss out on any must-buy titles. Pro tip: Arrange your book list in order of importance/priority. 3. Set a budget or bring a finite amount of cash. Remember, you still need to eat to live. If you’re bringing a credit card, set a budget and stick to it. But if you prefer cash, limit yourself to a certain amount. Extra bucks mean extra temptation! 4. Don’t be shy to ask for help. Book fairs usually have friendly shopkeepers and store assistants. If you’re looking for specific titles, don’t hesitate to ask. 5. Invite a friend or friends, or better yet, don’t invite them. This particular tip depends on what kind of shopper you are. Need help in deciding which books to buy? Bring your book-loving friend for company and designate her as your agony aunt who will dispense smart advice on your book buys. (And don’t forget to do the same for him/her.) Are you more of a lone wolf kind of shopper? Go at it alone. Sometimes, all you need is a bit of space and time for quiet reflection to decide if you’re going to buy that bestseller.